Military pet owners have more than road trip pit stops on their mind during PCS season. AHRN.com has put together some of our favorite resources for a Pet PCS! PCSing with pets can add an additional layer of choices, decisions and responsibilities to an already hectic time. During the confusion of moving it’s easy for pets to become disoriented, lost or stressed. A little preparation can go a long way towards giving your a pet a safe and smooth PCS. Cats often struggle when the family moves partially because they are much less socialized than our dogs. Take the time starting months before your move to get your cat accustomed to a carrier. Place an article of your clothing in the carrier, give out treats to the pet inside it and try to make it as comfortable and appealing as possible for your feline friend. By creating a level of comfort, your cat is more likely to run and hide in the carrier than trying to dart out into the street. In the same vein, if your pup associates the car with trips to the vet or groomers than now is a great opportunity to foster some positive association with the car – especially important if you will be driving to your next duty station. While this might not seem important, it will contribute to a much less stressful move for you if your pets are not experiencing anxiety. As you decide what belongings will travel with you in the car, put together a bag of comfort and convenience items for your pet and make sure it’s accessible. A leash, food and water dish, bottled water, pet first aid kit, disposable litterbox (for a cat), and some towels in case of accidents should be a good starting point. If you will be crossing state lines, see your vet before you leave to get a health certificate. You can be pulled over and asked for one if taking a pet from one state to another. Strangers in your home, belongings moving around, open doors, and general confusion make packing day a tough one for your pets. Make sure before the packers arrive that your pets are secure and relaxed. You might want to board them for the day (or couple of days), let them hang out a friend’s, or be crated in a room where there is less activity. If you’ve spent some time getting your pets used to the car, you’ll have a pretty good idea what it takes to keep them calm and happy on the road. Make sure that they are secured and safe while moving – loose pets in the car are vulnerable in accidents and can cause distracted driving. Dogs should be in crates or restrained with a safety harness. Cats should be in a carrier – covering the carrier for the first few hours on the road can help to calm anxious cats. Remember that dogs will need to get out at regular intervals like a toddler to pee and relax. During pit stops, be mindful that this is the most likely point for your pet to escape and run while disoriented. Temporary tags with your cell phone number can be added to their collar for a little extra protection. If you have TDY enroute orders or have multiple pets like birds, horses or very large dogs, it might be more feasible to find a professional carrier for your pets. Transport companies will handle the details of getting your pet from one place to another, a convenience that may be worth paying for if you have young children or will be stuck in a hotel while looking for your home and waiting for household goods. If you are considering a transport company, begin looking and interviewing at least 30 days in advance — and more if possible to give you time to find the best possible fit. Planning a hotel stay on your trip? Decide ahead of time how far you will travel and locate a pet friendly hotel. When it comes to pet policies, online or corporate policies are not enough. Call the specific location and check the pet policy. Many hotels limit access to dogs over 30 lbs, birds, exotic pets and sometimes cats. Hotels can also charge an additional fee per pet, so that should be built into your budget. Scout out pet friendly hotels online with Pets Welcome. Hotels are a vulnerable time for our pets on the move as it is too easy for a freaked out escape to happen when the door opens or while moving between the room and the car. Cats in particular will find new and creative hiding places. Utilize carriers and other restraints especially if you leave the room for any reason. Still looking for a new home? If you are concerned that your pets will make finding a rental a challenge, start by building a Pet Resume to communicate to property managers that your pet will be a good tenant. Once you are in your home, there are simple ways to make sure your pet gets a good review from your property manager. Help your pet get settled fast by sticking to the same routine. Try to keep their things in the same location – if the litter box was in the laundry room before, put it there again. Before you let your pets run loose in the new place, give it a very thorough once over and pet proofing. Know that you keeping calm and letting your pet’s behavior indicate what they need is the best bet as they make the transition to their new home. As you get settled, it is important to quickly locate the necessary services for you and your pet – a veterinarian, a boarding facility or pet sitter, pet stores and a great walking route for dogs! 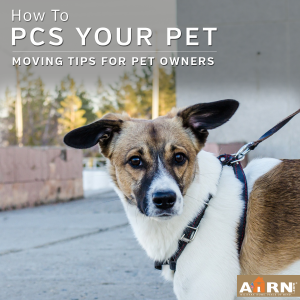 Oh, tips like these that mention about moving with pets sure is something that I could probably share with my brother in-law. Since he's in the military, he often gets nervous about moving his cat and his family with him from base to base. Well, at the moment both him and my sister are trying to find a local moving company that is pet friendly and that can carry their cat's belongings safely. Correy – are they doing a PPM move? Lovely tips! This is gong to be my first move since I have a dog and I’m so excited about this. we’ll be living in another part of the town, so it’s not a big move, but it’s a new place and I hope my Ruby will be fine there. The tips you’ve shared are surely very helpful and I’m definitely having them on mind for the big day. Thank you for these great ideas! I feel bad every time that we have to move – it is stressful on two of our cats. I keep our cats in a separate room away from it all, but the noises and all the changes still freak them out. These are great tips, thanks for sharing! It’s really hard for our pets, if we are planning to move around too a new place. They always face problems while we are shifting. and was very nervous, when he was brought to the new place. These tips would certainly help me and my dog, if we get to move second time. I’m sorry he had such a rough move, Mary! They definitely require some TLC during all the upheaval. This is a difficult time especially for cats as they do not like change! Our cats found the trip very stressful so once we reached our location we made sure there litter box was in a familiar room and there food was familiar! I think it’s a great idea to consider boarding your pet during a move. As someone with two kids and a dog, moving would be hard enough without trying to keep track of my dog and making sure she hasn’t run outside. Finding a boarding facility or having a friend watch her for a few days would definitely be a good idea. Thanks for the advice! My wife and I have one dog and she absolutely loves to be groomed. She always gets really excited when she sees me pick up the brush and I totally agree when you say it promotes quality time. I have been thinking about some more heavy duty dog grooming here in Clayton, NC and maybe getting some tips on what else I can do. Thanks for the tips! I had been planning for a vacation and was quite worried about my pet. But, through your post now I have got the idea how to handle the situation. This article is really help me to make decision. Now I am planning a vacation and taking my dog with me. Thanks for your tips. I never thought of trying to make a pet resume. Very interesting! I should consider trying that out the next time I move out with my dog. 🙂 Thanks for the share! I have a pitbull and I will move to the new town. I will surely keep the above points in my mind. Awesome tips. Thank you so much for sharing. Those are a bunch of useful tips! I wish I’ve read these sooner before we moved. Our adult dog was pretty difficult to handle, he peed when he got inside the vehicle and freaked out once it started moving. It went well, but we really had a hard time. Thanks for all your tips, we’ll surely use them the next time we (might) move. Great tips! I just moved into a new apartment a week ago. Thank you so much for sharing. Great article! I didn’t know that you could get pulled over and asked to see a pet health certificate! We traveled with our dog from Alabama to California and put a water bowl in the car so she could go get a drink whenever. Your tips based on Moving is really helpful. Those are an AWESOME of useful tips! I read your post, you write very relevant topics, it’s very important for an adult dog because it’s difficult to handle. I think it’s a great idea to consider boarding your pet during a move. your tips will be helpful who want to move, otherwise, its become very hard time.Thanks for all your tips, we’ll surely use them. A ton of helpful tips here. Added on checklist for next moving. Thanks! Thank you for the post. Yes, the first time we moved to a new place, I was very nervous about how my dog would cope and yes, he was under quite some stress. Your post will definitely help other pet owners. And, next time we move to a new place, we will definitely keep these tips in mind. Whenever I move or travel I use a crate to keep my dog from becoming overwhelmed. This is especially important if you have a dog that has a nervous bladder. And once I get to my destination I keep them in their crate in order to stop them from marking their territory or tearing the place up. Your tips are really useful. Thanks! Amazing ideas you have shared! I am going to move in a few days. I was worried about what to do with my two pet dogs, some birds while moving! You showed me a good way to manage everything properly. Thank you so much for your support. Fantastic blog! I have read the whole article . I am new dog owner , i have two pupps and 1 cats .Would you recommend any other blog for new pet owners? Moving isn’t only stressful to the family but to the pet as well. I remember bringing my dog in the car for a permanent move. Good thing the drive was only 2 hours. Really appreciate your work I am glad to read this article. Thank you so much for sharing.